Mood lighting. Yay or nay? Dude. I love Target. Srsly. LURVE. I ONLY shop the clearance at Target, and I score loads of the best stuff. Every time I go in there. Last week was no exception. 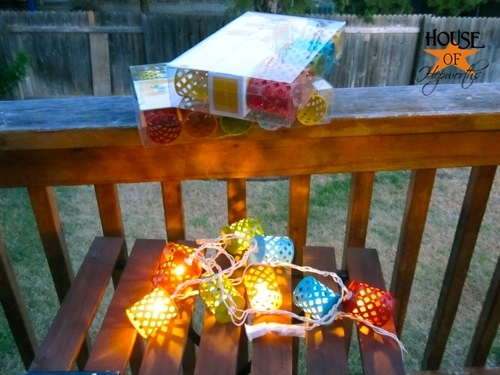 I found these adorable lights for less than $7 a box. Okay, okay… it wasn’t the best deal I’ve ever gotten at Target, but they are so cute, and I have been wanting some for forever, so I went ahead and bought them. 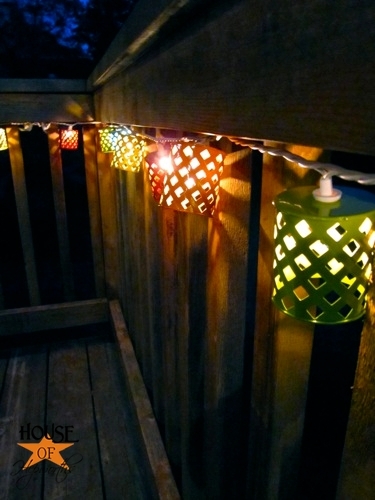 How perfect would these fun lights be on my little deck? I don’t know what’s gotten into me lately, but I’ve been on a serious spruce-up-the-yard tangent. In August. In 107 degrees. I am officially insane. I guess I can just feel Fall headed our way… this November. Ya, we don’t really DO Fall in Texas. I’m just so over the heat. 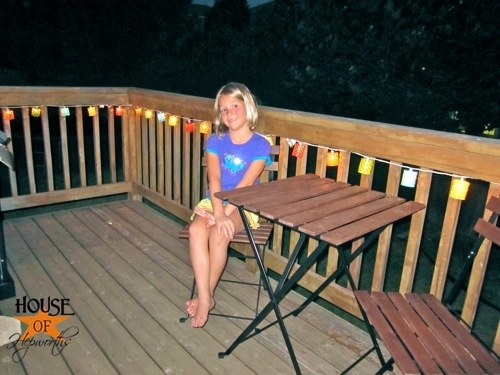 Anyhoo, the deck needed 3 packs of lights shockingly. Thank goodness I don’t have a normal sized deck. 3 boxes was already 20 bucks! Dang. I was so excited for my festive little lights that I couldn’t even wait until day time to put them up. 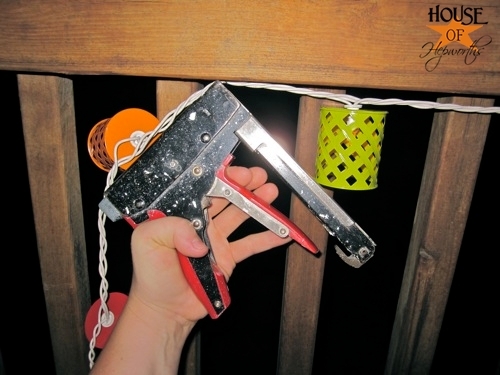 Okay, quick tutorial… To install, I used my staple gun that my dad gave me years ago. I think it’s Craftsman brand (Sears) but I’m not sure. Works great though. 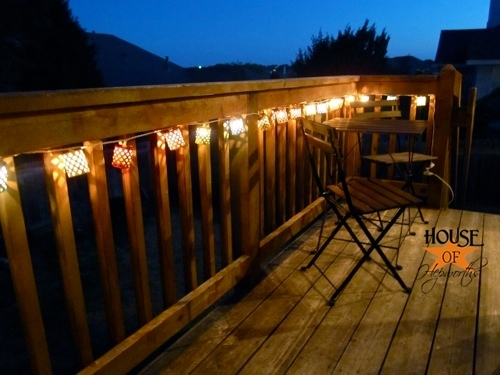 I just stapled the strand of lights every foot or so around the underside of the deck. WARNING! 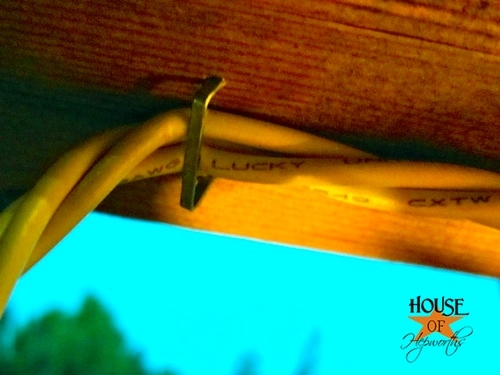 Make sure you put the staple on either side of the cord, NOT through the cord. See how the cord runs between the staple? If you puncture your cord it will probably short out and not work. Kinsey helped me hang them. She loves helping out with little projects. 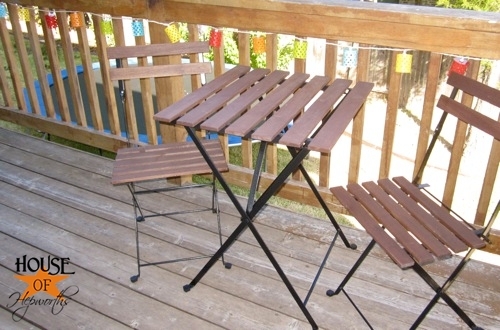 My new bistro set is already a crowd pleaser. Everyone is drawn to it and plops right down. It’s very inviting. We’ve had them up for a few nights now. So far, the family has flocked to the deck each evening just to stand there and “hang out”. I didn’t realize the lights would be so mesmerizing. Seriously. Could these lights be any cuter? The casings around the lights are metal, so I’m assuming they will hold up just fine outside. Plus, we’re totally in a drought so I don’t have to worry about too much rain. The real issue is the heat, but I’m not worried. And here’s a daytime shot. I love the bright colors. Finally, after a year in the house (can you believe we’ve been here a whole year?!!! 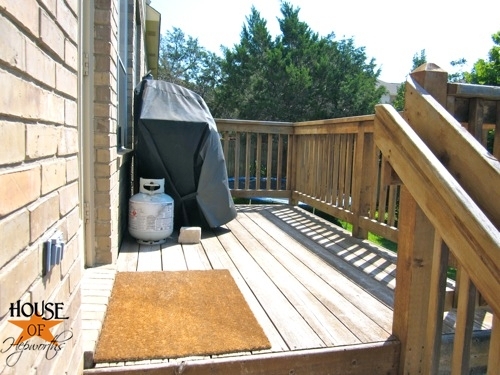 ), the deck is spruced up enough that I don’t cringe every time I open the back door. We recently added the Bistro Set, and now we’ve got this great mood lighting. For the first time ever, last night I sat outside with my laptop and actually enjoyed my space. It was so blissful and relaxing. And thanks to the drought we are in, we’ve been strangely mosquito-free this summer. Double bonus. Am I the only one who likes moody lighting on my deck? Do you have any? How do you like to relax outside? « TIMBER! If a tree falls in my yard, but you didn’t hear it, did it make a sound? I looked at these just the other day! They only had one set and I was too cheap LOL. I like how they look on your deck. LOVE it! Your patio is coming along! 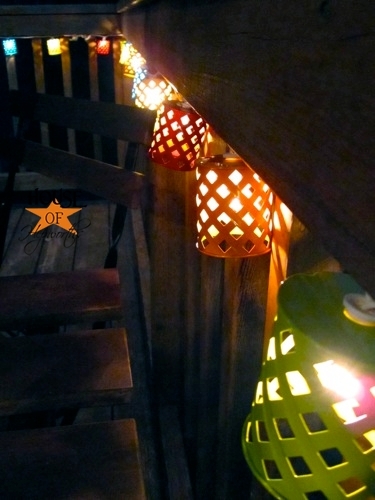 We did this in our backyard with plain Christmas lights, but these look so much cuter! I think it adds such a nice glow, without being to stark on your eyes! I love the lighting, it’s adorable!! Looks awesome! You could take one of those bright colors like the teal or green and do chair cushions or a bright new door mat. Love it! I love love love those. I am gonna run out to my Target as soon as I am done typing;) Super cute!!! I love those! 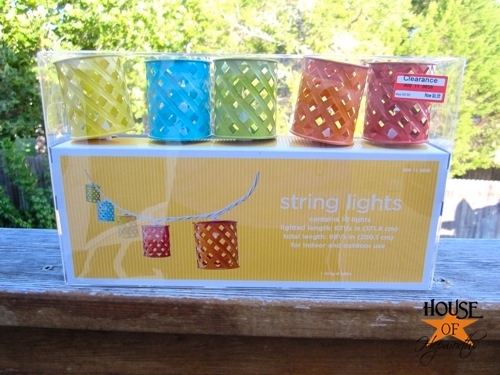 I have a big back patio, so I have put off buying any lights, cuz I know I will need lots of them. I’ll have to go check out my local Target and see what they have. I missed you, sounds like you had a super vacation. Your lights look so festive, now you need to have a party. I’m a candle gal, tons if candles inside and out. I would love to have mood lighting. Yours looks great turned on or off! Now I know why I don’t have many mosquitos and why they have them at my dad’s. My dad is by the beach and I’m in the Valley and it’s hot and dry. Ok. I digress… Your lights are adorable and worth the $20. Really adds to the new bistro table. I think it looks great! Little things like that always make such a big difference! Huge fan! Huge. Of yours I mean. The lights are bonus. 🙂 I DO love mood lighting, indoors and out and yours are just ubber sweet! I have some but they are old and decrepit and in great need of a do over. I’m now inspired to check out the clearance. 🙂 Heading to Winners today. Here’s hoping! So I guess I’m adding “grab lights at Target” to my to do list. But I’m painting them white. My back yard already looks plenty mismatched as it is and the multiple colors might induce seizures in my confused guests. 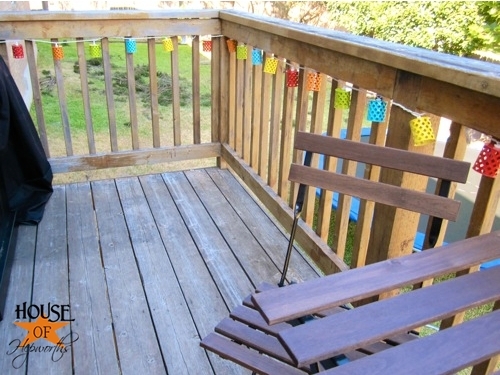 I like how festive they look on your (much more neatly organized) deck though! 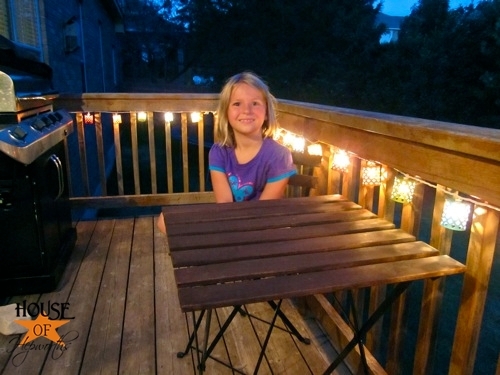 We have “mood” lighting in our backyard too! I LOVE turning them on at night! 🙂 Keep it! These are adorable! I never find anything this cute at Target, I must not go enough… 😉 I guess you don’t have any mosquitoes, because they are all over here! I love Target too…and don’t even get me started on the clearance awesomeness! You scored on the lights. 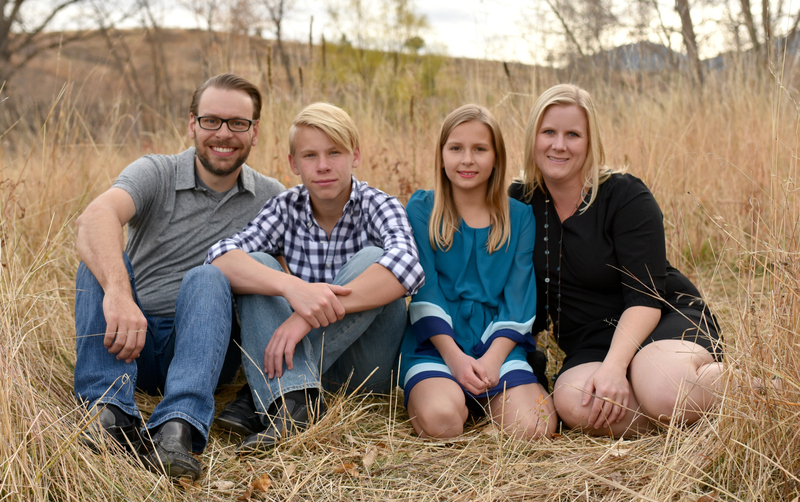 They are super cute. I wish I had a deck so I could copy you. That was seriously only one package?! That looks super awesome! I wanna sit on your deck.